A: Section Lloydia consists of a single species which has the distinction of being one of the only truly peltate-leafed species. This very strange leaf shape is one of the primary characters of the section. 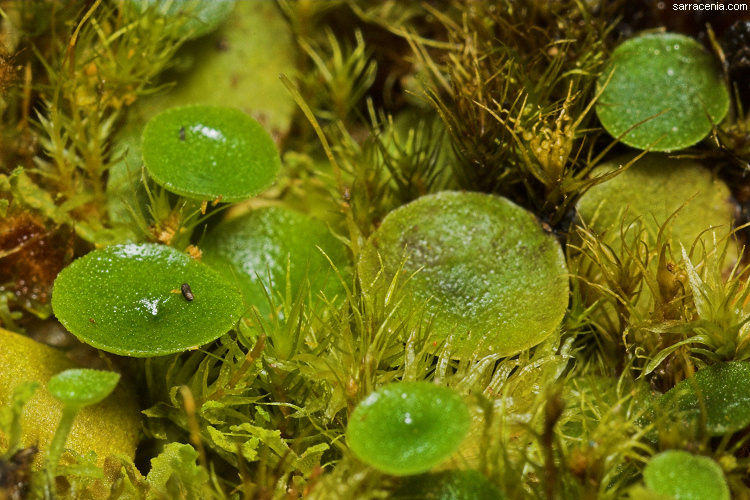 The single species in the section has, like Utricularia livida, a strange range that spans both the new and old worlds. The flowers of this species have a great deal of variation. Often they can look very much like those of Utricularia livida. Fortunately, U. pubescens has basisolute bracts that allow even specimens lacking leaves to be identified with reasonable certainty. The leaves of U. pubescens are often distinctly gooey leaves; they produce a kind of mucus on their upper surface. As far as I can tell, the species epithet is earned because the plant has slightly hairy calyx lobes. A somewhat odd thing to commemorate, don't you think, since the plant has such bizarre leaves? Page citations: Rice, B.A. 2006a; Taylor, P. 1989; personal observations.